Former PM Olmert says any military action against Iran should be led by the U.S., hints he doesn't trust Netanyahu and Barak. 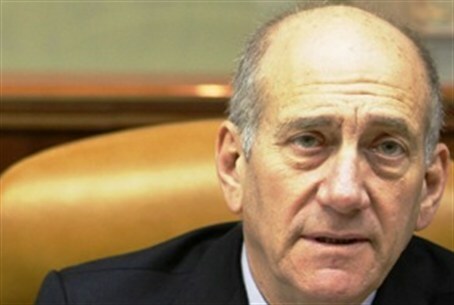 Former Prime Minister Ehud Olmert has said that if international efforts to halt Iran's nuclear program fail, any military action against Tehran should be led by the United States and not by Israel. In the interview, Olmert also responded to the harsh remarks made over the weekend by former Shin Bet head Yuval Diskin. Olmert also implied that, like Diskin, he did not trust the current leaders of Israel to make the right decisions. Olmert, who faces a series of indictments and court hearings on charges of bribery and abusing public trust, was recently the keynote speaker at the annual J Street conference. The organization describes itself as being “pro-Israel” and “pro-peace,” but many Jews believe that the organization actually undermines the interests of the State of Israel and Jewish people. Only several days ago, J Street’s regional director said that in the event that war broke out involving Israel, J Street would not necessarily support the Jewish state. When Olmert served as Prime Minister, he was determined to reach a peace agreement with Palestinian Authority Chairman Mahmoud Abbas. He went so far as to offer Abbas 94 percent of Judea and Samaria, a shared jurisdiction of Jerusalem, and allowing 5,000 PA Arabs who left their homes in 1948 back into Israel. The details of Olmert’s offer were revealed several months ago in former U.S. Secretary of State Condoleezza Rice’s memoir.